Dutch-designed Woodmobiel is an amazing, life-size do-it-yourself wooden building kit made with FSC certified wood. The kit comes with real tools that allow kids to get active, stay creative and push their design skills to a whole new level. 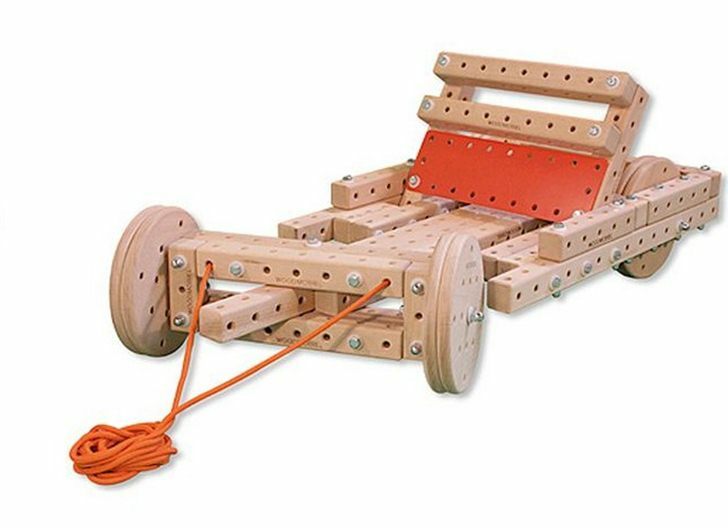 Woodmobiel kits consists of life-size, pre-drilled pine posts, pine wheels and plastic boards along with steel cap nuts and bolts. Combination wrenches allow all the pieces to be joined together and may be configured in a wide variety of ways. Keep reading to see what neat things your child will be able to build. With OOTS Woodmobiel, kids can make their very own wagon, a cool go cart, a tricycle, a puppet theater, or even design an awesome airplane. Woodbobiel can also be used to design more practical creations, like an easel, desk or step stool. Ben Fritz, a Dutch graphic designer, created Woodmobiel for his grandchildren, but adults are sure to find this toy stimulating and fun as well. The Woodmobiel starter kit comes with directions for many different designs such as a scooter, a step bike, a crane, a wheelbarrow, a blackboard, a trolley, a chair, a table and a plane. 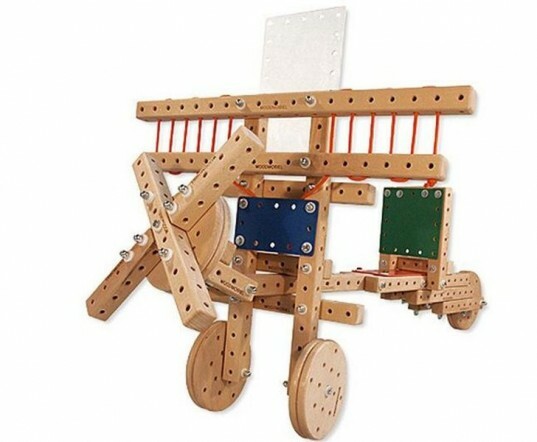 The standard kit lets your child build even more cool items, like a speedy race car, a larger plane, a blackboard with desk and bench, a tricycle with luggage rack, a wagon, a table-and-chair set, a wheelbarrow, a birdhouse, and a stroller. Once you build a structure, play with it and get your fill, the structure can be broken down and you can build something brand new. Woodmobiel will be available this August. Locate a retailer at OOTS or contact OOTS for more information. With OOTS Woodmobiel, kids can make their very own wagon, a cool go cart, a tricycle, a puppet theater, or even design an awesome airplane. Woodbobiel can also be used to design more practical creations, like an easel, desk or step stool. Ben Fritz, a Dutch graphic designer, created Woodmobiel for his grandchildren, but adults are sure to find this toy stimulating and fun as well.